China's services activity expanded in March even as growth in employment and new business fell to their lowest in at least eight months, a private survey showed on Friday, in yet another sign that the weak Chinese economy may need more policy aid. The HSBC/Markit China Services Purchasing Managers' Index (PMI) inched higher to 52.3 in March, compared with February's 52.0, and above the 50-point level that separates growth from a contraction in activity on a monthly basis. But the marginal expansion was offset by lacklustre growth in employment, which fell to a 10-month trough of 51.1. Growth in new businesses was at an eight-month low. "Chinese manufacturers and service providers both managed only modest increases in output at the end of the first quarter," said Annabel Fiddes, economist at Markit, adding that data "suggests that relatively weak client demand had dampened growth across both sectors". Fiddes said service sector companies "took a more cautious approach to hiring, raising their staff numbers only slightly over the month, while job shedding accelerated across the manufacturing sector". The services survey resonates with three other PMIs released earlier this week that showed stubborn weakness in China's factory and services sectors last month, adding to bets that Beijing will have to increase policy support to avoid a sharper downturn. Slugged by a cooling property sector - where prices fell at a record pace last month - and a slowdown in exports and investment, China's economic growth is expected to slip to around 7 per cent this year, the worst in a quarter of a century. Even the services sector, one of the rare bright spots in the world's second-largest economy last year, appears have finally succumbed to the broader economic downdraft, judging by the recent patchy performance in the PMI. Indeed, HSBC/Markit noted that business confidence in the sector was well below the historical average in March. To stoke growth, many economists expect China to further cut interest rates this year, reduce the amount of reserves that banks must hold and unveil additional measures to help the weakest sectors such as the housing market. Regulators on Monday cut downpayment requirements for home buyers for the second time in six months. The last time China relaxed banks' reserve requirements was on February 4, three days after an official survey of the factory sector showed activity unexpectedly shrank to a 2-1/2-year low. As China remakes its economy to boost domestic demand and reduce reliance on exports and manufacturing, services are an increasingly important growth pillar. 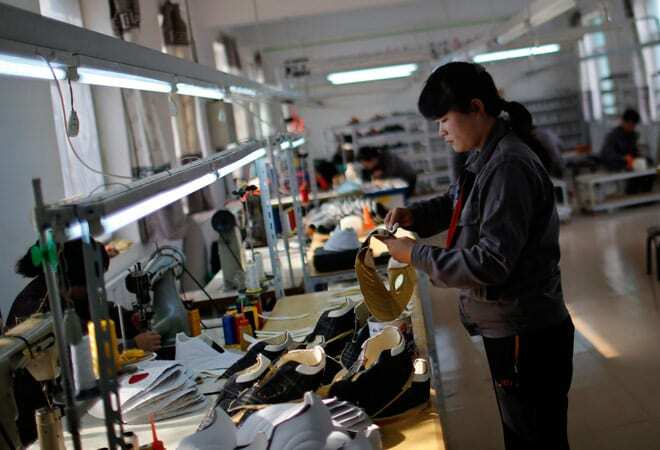 It has accounted for the bigger part of China's economic output for at least two years, with its share rising to 48.2 per cent last year, compared with the 42.6 per cent contribution from manufacturing and construction.